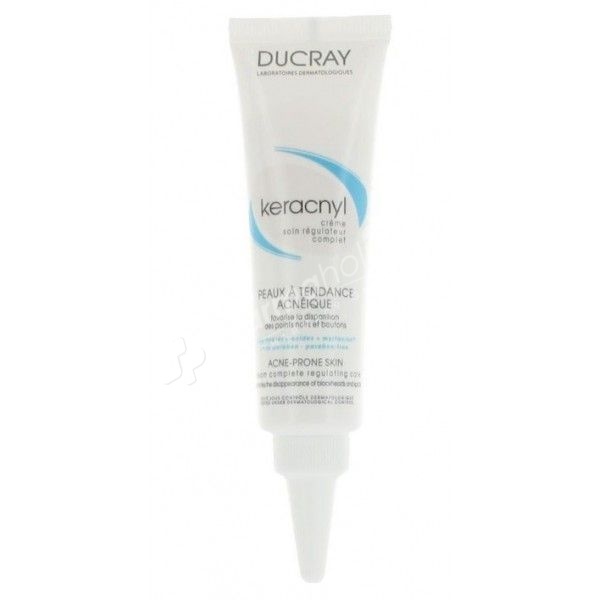 Ducray Keracnyl Care Cream Regulator acts on all factors favoring the formation of pimples and black heads, while being an excellent base of makeup. Acts on all factors favoring the formation of pimples and blackheads unsightly, while being an excellent base of makeup. The result is visible from the first month of application thanks to a unique combination of powerful and complementary active ingredients: the skin becomes smooth and healthy again. Myrtacine, a sanitizing agent, fights the bacterial proliferation of micro-organisms and more specifically P. acnes and promotes the disappearance of pimples and skin imperfections. The combination of zinc salicylate and Sabal serrulata extract regulates excess sebum. Anti-irritants, alpha-bisabolol and stearyl glycyrrhetinate soothe the skin. Apply 1 to 2 times a day on cleansed and dry skin. Non-greasy texture, ideal as a makeup base. water / aqua, cetearyl isononanoate, glycolic acid, cetearyl alcohol, polymethyl methacrylate, glyceryl stearate, sodium hydroxide, sodium chloride, ceteareth-33, dimethicone, acetic acid, bisabolol, caprylic / capric, triglyceride, citric acid, disodium phosphate, fragrance, lactic acid, myrtle communis leaf extract, salicylic acid, serenoa serrulata fruit extract, stearyl glycyrrhetinate, xanthan gum, zinc salicylate. During application, a slight tingling sensation may occur. This transient manifestation is related to the activity of the product. Do not use in children and do not leave within reach.